BROWN COUNTY—At the beginning of August, a group of eight teenagers from St. Agnes Parish in Nashville and 12 teenagers from St. Ann, St. Benedict and Sacred Heart of Jesus parishes in Terre Haute came together with their youth ministry leaders to help people in need in Brown County. Indiana Nazareth Farm is an annual service camp sponsored by St. Agnes Parish and the Terre Haute parishes. It is based on four cornerstones—community, prayer, simplicity and service. Each teenager and adult leader provided more than 28 hours of intensive hard labor in just three and a half days, equaling 728 hours of volunteer service. Team leaders were youth ministry coordinator Adrianne Spahr from St. Agnes Parish in Nashville and Janet Roth, the youth ministry coordinator at the three Terre Haute parishes. 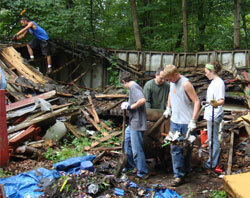 This year, projects included excavating and moving hundreds of rocks to build a dam and a retaining wall to protect property from water damage, staining a huge wrap-around deck, demolishing a two-and-a-half car collapsed garage, assisting with the building of a Habitat for Humanity house, cleaning up yards, mowing, spreading mulch, washing windows, cleaning gutters, moving dirt, weeding yards and large slopes, and general yard cleanup. Though the group spent many hours working, the youths and adult leaders set aside time for prayer and reflection every morning and evening as a group. The original Nazareth Farm was formed as an association of the Catholic Church, and is located in the Diocese of Wheeling-Charleston in West Virginia. 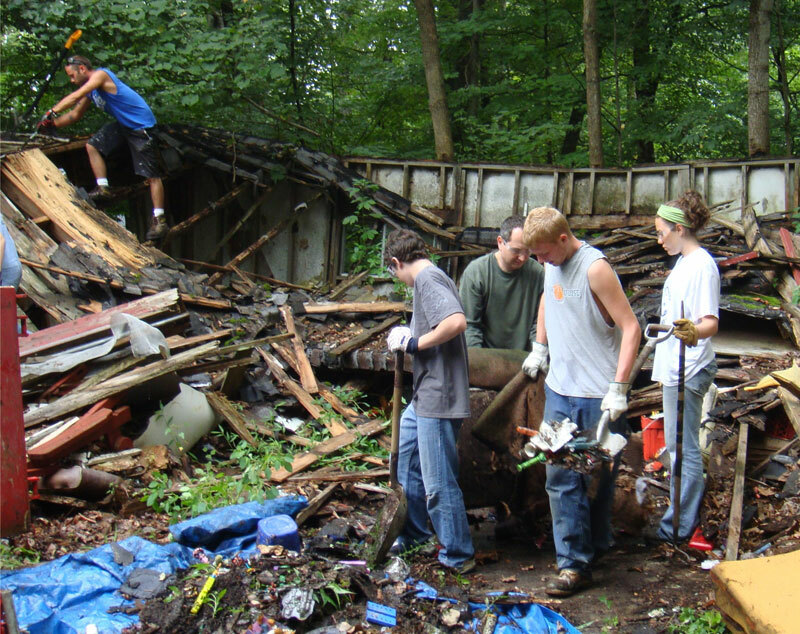 Its purpose is to provide volunteer service to the people of Appalachia. In 1994, the program was started in Brown County by youth ministry leaders in Nashville and Terre Haute. Each year, the youths are exhausted but energized, and look forward to participating again. Brown County residents who need assistance are encouraged to keep this outreach in mind if they have needs that could be accomplished next summer.